Merry Christmas and Happy New Year to all! I was planning on doing some posts during the past few weeks but.... yeah. Time just goes so quickly and I cannot believe that Santa has come and gone and we are getting ready for the new year. With the new year comes some birthdays and I wanted to make a pretty card for the first birthday of the new year that we celebrate. Happy Birthday Ursula! 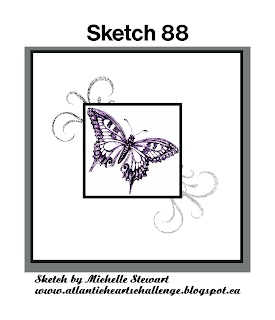 This weeks design challenge from Atlantic Hearts was perfect (of course) to help me get started. As you can see I really followed the design on this one! 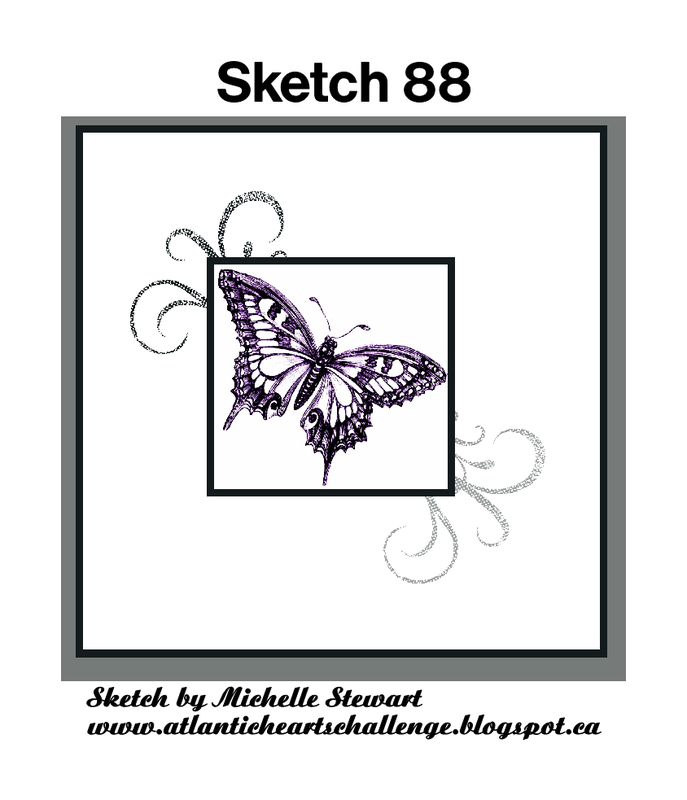 I made my card base to be 4 1/2 x 4 1/2 for a change and it created an nice frame for my butterfly's. To create this card I used the oh so pretty papers from the Brushed paper packet and the lovely butterfly's from Your Own Kind of Wonderful (D1627) stamp set. For the stamping I used Thistle and Pixie Ink and I swiped all the edges with Thistle for added dimension. I surprised myself in that no coloured cardstock was used in the making of this card but I did use some of the new extra thick twine in Pixie and I like it! A few sparkle flourishes and this very pretty birthday card is done. Candra this is so pretty! I love the way you layered the papers and added bling to the butterflies. I love this card! It is bright and colorful and cheerful especially considering the cold dreary weather we have been having it is a great bright spot! This is gorgeous with those two paper backgrounds!